ASIDE: On 4/5, and 5/3 Jim Harlan and I will be playing from 5:30 – 8:30 pm at Upper Crust in Eldorado. I’m thrilled. You can see the share here on James Taylor’s Facebook page if you’re logged into the app. If you’re not on FB, you can see the video at the bottom of this post. Friday evening will be sweet on Canyon Road as the galleries participate in a Holiday Block pARTy. Jim Harlan and I will play Americana tunes at Winterowd Fine Art from 4:15 – 6:45 PM. Come do an Art Walk with Farolitos and Bonfires. Here are 2 fun music options to choose from. I hope to see you! Sunday 11/11/2018, 5 – 9 pm – A FUN FREE BENEFIT! This was a snowy, very fun event. Music and book reading benefit for Bienvenidos Food Pantry. I sat in with Julie Cunningham and Larry Diaz at the beginning and end of this event. Jon D’Amore and chef/author Connie Ruel read from their bestselling books. Super fun. All book sale proceeds went to the Bienvenidos Food Pantry. 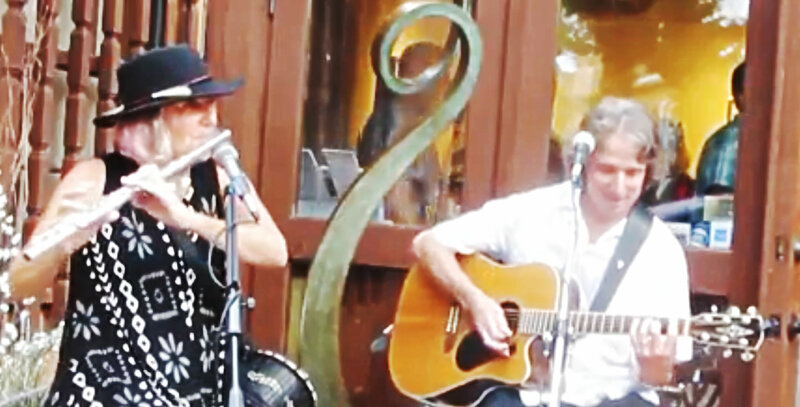 I played with Chris Harrell at a very fun Savor Eldorado event. I sat in with him at Upper Crust a couple times and had a ton of fun. Everybody loves Chris’s spirit and huge repertoire of Americana and originals. I’ve asked him to do a set of his Santa Fe/Lamy/Eldorado tunes. Evie Gauthier opened her home and share her lovely jewelry and wearable art. As president of the Eldorado Arts and Crafts Association (which produces one of the largest studio tours in the state), Evie is well-connected with local artists and welcomed Savor founder Gila Joy Pascal and Kim Crickard to share the spotlight. RSVP and see the artwork here >>. RAFFLE: Every $10 suggested donation got 2 raffle tickets, eligible to win a $100 bill. The drawing was held at about 5:30 pm. A fun music weekend in Eldorado! This Friday, 11/2 from 5:30 to 8:30 pm I will jam to some Americana tunes and originals at the Upper Crust in Eldorado with Jim Harlan who is a very talented and fun singer/songwriter/guitarist. You can hear a sample of our music here. 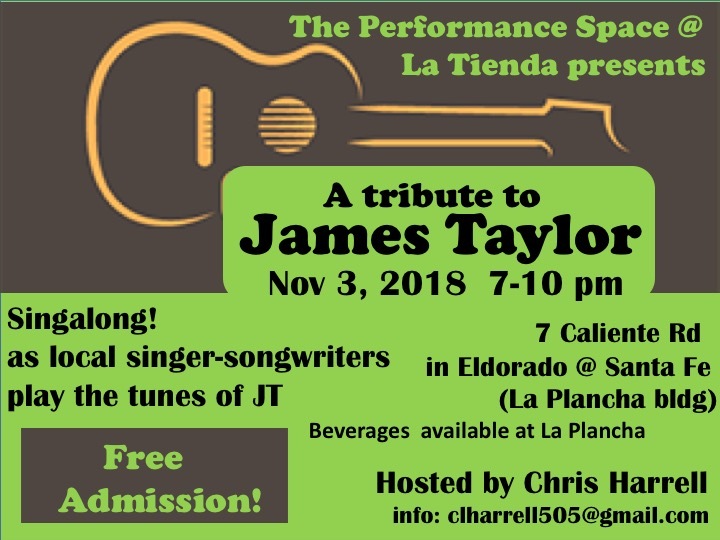 On Saturday at 7 pm Chris Harrell is producing a James Taylor tribute show at the Performance Space at La Tienda Eldorado. I’ll be playing on some of my favorites, along with local players and singers. Very fun. Sunday I’ll be part of the audience for local youth musicians at 1:30 at the Performance Space. Lisa Carman has taught many of our adult and young musicians. She’s back visiting from her recent move to Bozeman MT. Her adult students will perform at 5pm Sunday. I would like to expand Savor Eldorado from the “sea of silver” out here on the “white res”, to younger and older elder musicians and artists, so Sunday I’m scouting for young talent. I would also like to get a county van to pick up elders who don’t drive and bring them to Savor events. All ideas are welcome. Recently I was asked to record a flute track on my friend Julie Cunningham’s original piece “Realize”. To show her my idea, I used an app on my iPhone (Hokusai) and sent the flute track to her. Amazingly, they are mixing that iPhone recording onto a CD!